Geoengineering is inherently high-risk and its negative effects will likely be unequally distributed. Because of this, geoengineering has often been presented as a “Plan B” to confront the climate crisis. But after the Paris Agreement, which set the ambitious goal of keeping the temperature to well below 2°C and possibly even 1.5°C, the discourse has changed. Now, geoengineering is increasingly being advanced as an “essential” means to reach this goal, through a mix of risky technologies that would take carbon out of the atmosphere to create so-called “negative emissions” or take control of the global thermostat to directly lower the climate’s temperature. 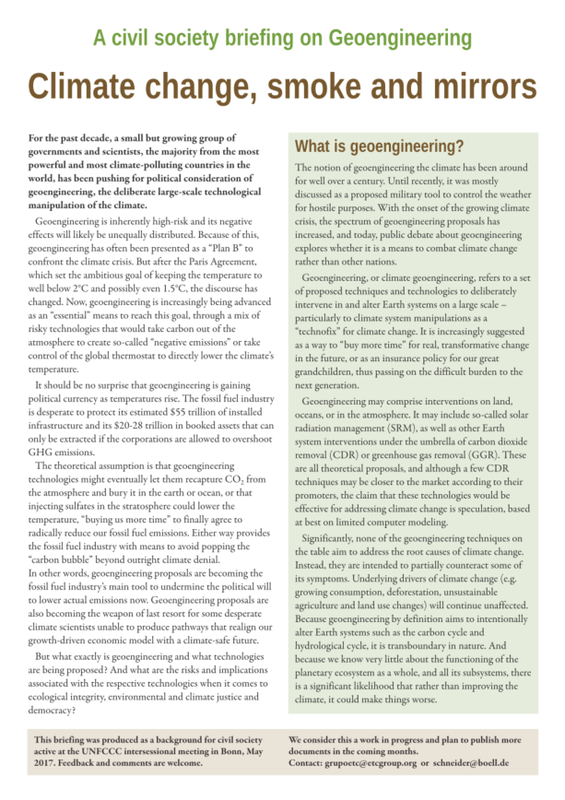 A new briefing paper by ETC Group and Heinrich Böll Foundation in advance of the UNFCCC intersessional meetings in Bonn, May 2017, gives an overview of what geoengineering is and why it is dangerous, as well as up-to-date information on proposed geoengineering technologies and governance. A crucial read for anyone engaged in the fight against climate change.